Why do you make? On her blog, Melanie Falick recently asked the question, “Why is making with your hands important to you?” I have to say that I was so excited to read that she’s interested in hearing a whole range of answers to this question. It’ll help her with research for her new book. (Pop over and let her know your answer too, if you’d like to share). But it’s a question I also have a passion for! It is something I have been thinking about for a long time. Here’s the answer I came up with for Melanie. Perhaps you will be able to relate in some small way. I’d love to hear your thoughts too. I have always been a creative type. For me, crafting isn’t something that I do, it is just very naturally part of who I am. I used to be teased a little as a young adult because I would paint, garden, bake, sew and make all the time. And my friends didn’t understand. I always wanted to be an artist. But as a child I thought that meant being a painter. Even into my adulthood, I thought that was an unachievable goal. But the transformation that technology has brought to our lives has been so amazing and inspiring, it seems that any dream is possible! Now I can create my own form of art. So now I sew, I craft, I blog, I teach and live my passion every day. I truly feel that I am an artist in this crafty world. And it’s wonderful! I can share my passion with likeminded people who might be on the other side of the world. I can create or join a community of sewists and crafters, makers and artists. I can be with ‘my people’ and this makes following my creative pursuits and passions so much easier! The global craft community can be such a beautiful, supportive space. And it warms my heart to see so many people coming together and sharing their passion. In a time when we can quickly become lost, and feel disjointed and isolated, the internet allows us to learn, to share, to teach and to be ourselves. Who would have thought? My mother often laments that she wished she’d had the opportunities that I have now, to share her sewing and making in her youth. She’s in awe of the way many of us are carving out a living, or bringing in a supportive income while doing what we love. 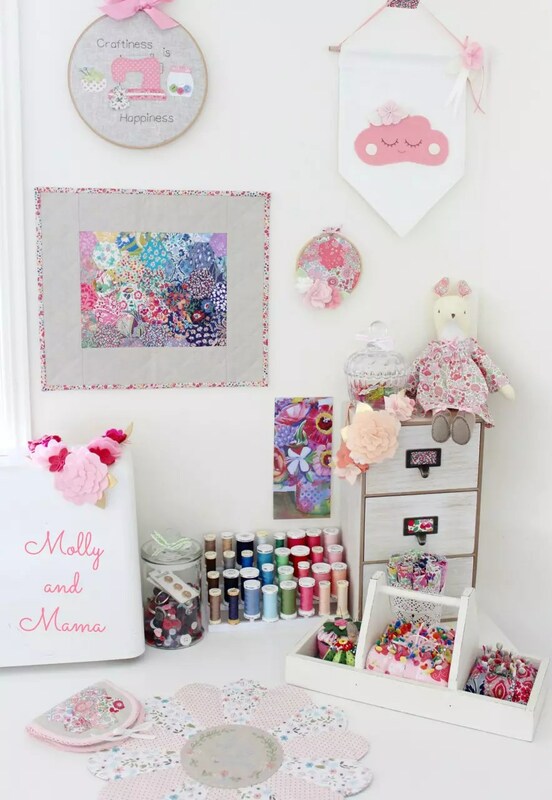 My sewing doesn’t have to be relegated to a hobby the way that hers had to be. And it pleases her to see that although what I do is different to what she did, and what her mother and grandmother taught her, there is still so much value in it. By continuing to craft and sew, I am ensuring that those wonderful skills don’t fade away. I used to be so frightened that all those wonderful traditions that were passed on from grandmother, to mother, to daughter, would be lost. I worried that as our world became more fast paced and frenetic, people wouldn’t have time to teach the next generation how to sew and make. I was worried that the beauty created in making everyday things would be lost with our grandmothers and mothers. And whilst lots of mothers haven’t had the chance (or the inclination) to learn to sew and make, and then pass on those skills, many of us have. And what we can’t learn from our family, friends and community, we can choose to learn online. It’s beyond wonderful! I make with my hands, because I blessed with two hands. I make with my hands, because I am blessed with a brain, a creative inclination and a passion and desire to share the joy that comes with building something beautiful. I make with my hands because I couldn’t conceive of not making, creating, sewing, baking, planting, painting, drawing, and feeling. I make with my hands because I can. Why do you make? I’d love to know! Dear Lauren, I just have to tell you how wonderful it is to read your post. I just happen across it and I am so happy that I did. I totally agree with everything that you have stated. I fell the same way as you. It is so refreshing to know that someone as young as you will still use her hands and not afraid to say so. I have always done things by hand and love it very much. I also quilt, sew, embroider, knit, crochet, bake, cook, plant, counted cross stitch not to much any longer, my eyes are not want they used to be. Thank you so much for sharing your story with me. Sending hugs your way. I make with my hands because it is an American Indian tenet … what? The act of “giveaway” is one of the four basic tenets that are shared by American Indians and many aboriginal People around the world. Being able to carry that gift and pass it on to generations to come is what fills my heart with joy! Each and every stitch, each and every embellishment confirms my intent and actions to carry on what my ancestors’ dreamed I would do for generations to come. Everything I make is given away and what I teach to younger generations affirms that GIVEAWAY will continue.